Fill the sink with cold water and thoroughly wash the asparagus. Cut off the hard stalk-ends and, using a potato peeler, pare off the tough skin on the lower part of the stems. Discard the trimmings, then cut each stem in half across the middle of the stem. Roughly slice the lower halves. Divide the stock between 2 pans and bring both to the boil. 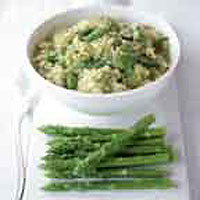 Add the sliced asparagus stalks to one, return to the boil, then cover and simmer for 10 minutes or until tender. Meanwhile, pour the oil into a wide sauté pan and set over a low heat. Gently fry the diced onion until soft. Cut off the tips of the remaining raw asparagus and slice the stems into pea-sized rounds. Add both rounds and tips to the sautéed onion with the butter and cook for 2 minutes before stirring in the rice, making sure it is well coated in the fat. Fry for 2 more minutes, then stir in 2-3 ladles of the plain simmering stock. Keep stirring regularly, adding more stock as the rice absorbs the liquid. Meanwhile, purée the chopped asparagus stems with the stock they've been simmering in. Strain back into the pan. When you have finished the plain stock, slowly add the asparagus purée stock to the rice. After about 20 minutes, all the stock will be absorbed and the rice should be cooked, with a slight bite. Stir in the Parmesan, season and serve. Add some extra lightly cooked asparagus if you like.